Vast numbers of bluebottle jellyfish have been pushed ashore in Queensland, Australia, stinging thousands of people and forcing the closure of swim spots. Unusually strong winds pushed the jellyfish colonies towards beaches. Most incidents took place in Queensland’s heavily populated Gold Coast and Sunshine Coast regions. Bluebottle jellyfish colonies appear like blue-tinged sacs which measure up to 15cm (6 inches) long. People can be stung in the water or on sand. Bluebottle jellyfish, also known as Portuguese man o’war, are often seen on Australia’s east coast during summer. But a SLSQ spokesman described the latest influx as an “epidemic”, while some local media outlets labelled it an “invasion”. She said “a really weird run” of strong winds and heat spells had brought bluebottle jellyfish and other species closer to shore. But she added that given those unusual weather conditions, the number of jellyfish should be considered “not abnormal”. The species is most commonly found in deeper seas, but can be moved easily because it has a “sail” crest on its back. 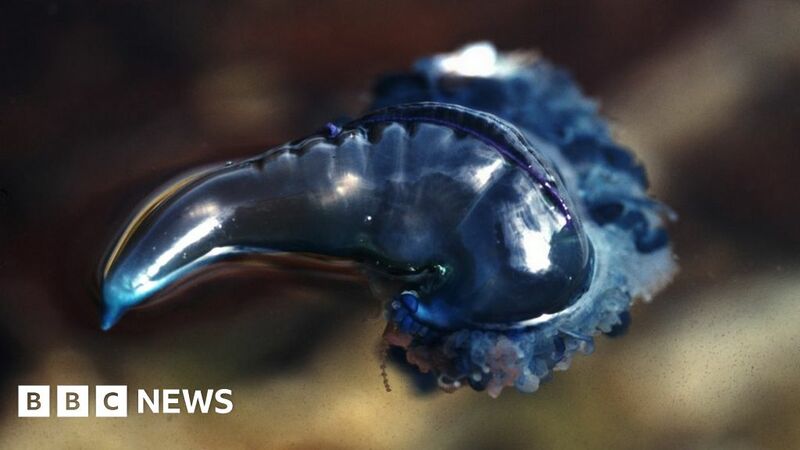 “A bluebottle has that sail that sticks up – so the wind grabs the sail and drives them ashore,” Dr Gershwin told the BBC. Kenya terror attack: Who are al Shabaab?